Tipton has been working in the dubbing industry since 2008 and has loved every minute of it. Some of her other DVD/FUNimation Broadcast dub credits include Haru Ichinose ("Riddle Story of Devil"); Chu Chu ("Show by Rock! "); Hana Midorikawa ("Prison School"); Honey ("Space Dandy"); Maria ("Maria The Virgin Witch"); Kureha Tsubaki ("Yurikuma Arashi"), Kofuku ("Noragami"); Anya Hepburn ("Soul Eater NOT! "); Saya Kisaragi ("Blood C/The Last Dark"), Inori Yuzuriha/Mana Ouma ("Guilty Crown"); Rika Shiguma ("Haganai"); Kurumi Tokisaki ("Date A Live"); Julia Crichton ("FMA: The Sacred Star of Milos"); Moka Akashiya ("Rosario+Vampire"); Musubi ("Sekirei"); Mizuki Himeji ("Baka and Test"); Fukurou ("One Piece"); Yomi Isayama ("Ga-Rei: Zero"); Sun Seto ("My Bride is a Mermaid"); Chibi Japan/Kumajiro ("Hetalia") and many more. On top of her anime dub work, her voice can also be heard in a handful of video games, including "Tales of Zestiria" (Alisha); "Lord of Magna: Maiden Heaven" (Beatrix and Sarine); "DBZ Xenoverse ("Gotenks-Trunks"); Borderlands 2, and more. She can also be heard in several foreign live action film dubs ("Ip Man," "War of the Arrows," "Tai Chi Zero/Hero," "Ice Man," and more). She has also provided vocals for various character songs and a few of FUNimation's trailers. 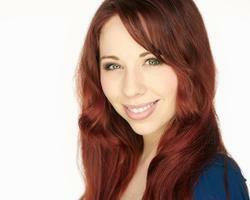 Tipton has been a stage actress most of her life and is currently studying opera and film. She resides in Dallas, Texas, but also works in Los Angeles, California. Follow Alexis on Twitter: @AlexisTiptonVA.